Haimo Technologies Group Corporation, a multinational company headquartered in Lanzhou, China, is engaged in oilfield equipment manufacturing, oilfield technical services and unconventional oil and gas exploration and development. Established in 1994, Haimo Technologies has offices in different parts of the world and a sales network through different business partners. Its focus is on multiphase metering products and integrated solutions. Haimo products and services are offered to 27 countries in the Middle East, North Africa, West Africa, South Asia, Southeast Asia, South America, North America and Central Asia. 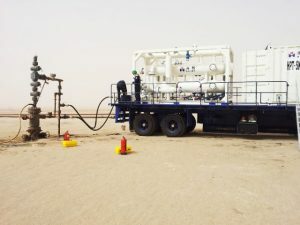 Bell Oil & Gas (BOG) has been in partnership with Haimo for its unconventional well testing service using the Multi-Phase Flow Metering (MPFM) technology for more than ten years. This partnership has resulted in BOG’s capability to carry out well testing for its clients using the MPFM technology. Haimo Technologies offers Multiphase Metering Products and Services, Fracturing Equipment and Services, Environmental Protection Equipment and Services, Integrated Production optimization Services and Exploration and Production services. 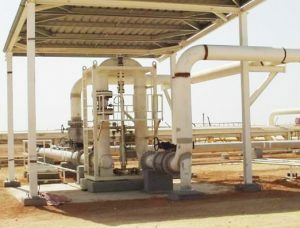 Multiphase Metering Products and Services: The Multiphase Flow Meters (MPFMs) are systems that measure flow rates of individual components of an oil and gas well stream without first separating the components. Compared to conventional Test Separators, MPFMs are smaller; provide results much faster; require much less maintenance and provide additional data to be used for production optimization. 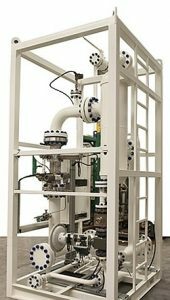 Haimo provides Spool Piece MPFM, Wet Gas Meters, Bulk Multiphase Meters, High Performance Testers, Low Production Testers, Shale Oil/Gas Meters, mobile well testing and production measurement services. Fracturing Equipment and Services: Thanks to ONthe technological advancement in the field of hydraulic fracturing, the Shale Revolution would not have been possible. 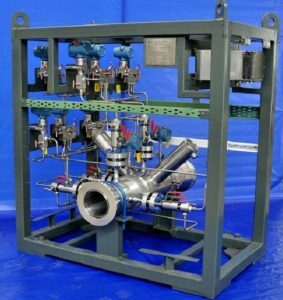 Fracturing pump fluid-end assembly is a critical component of hydraulic fracturing system and its reliability and longevity directly affect the safety and success of fracturing operations. Haimo Technologies proudly provides top quality fluid-end assemblies, accessories including joints, valves and valve seating; ball injectors, high pressure flowing elements and manifolds all over the world. Environmental Protection Equipment and Services: Haimo Environmental Service Group (ESG) is a professional environmental services provider specialised in wastewater treatment and reuse, solid waste disposal, contaminated soil remediation from industries of oil & gas production and refinery, municipal, mining and chemical processing, etc. Haimo ESG, wholly owned by Haimo Technologies, can provide clients with services including technical consulting, equipment design and manufacturing, installation and commissioning, after-sale services, etc. Integrated Production Optimization Services: While MPFM can be used in custody transfer, surface well testing, and allocation metering, real-time multiphase flow measurements also offers a wealth of information that can be used in production optimization at various scales. Haimo’s Integrated Production Optimization Services (IPOS) through rich operational experience and combination of reservoir and production data, provides value-added services including data validation and cleansing, well testing verification and optimization, intelligent allocation, water injection optimization, real-time well monitoring and alarm systems, production analysis and production enhancement consultation. Exploration and Production: Haimo Technologies is the first Chinese listed private company to participate in unconventional oil and gas production in the United State (US). Haimo America, Inc. is an independent energy company that is devoted to energy industry investments across North America. It is also a licensed oilfield operator and produces oil and gas in Permian Basin in West Texas. It also manages production from a joint venture in Colorado. Multiphase Flow Measurements: Onshore/Offshore MPFM, Sub-sea MPFM and multiphase pumping systems; subsurface MPFM and non-radioactive MPFM. Hydraulic Fracturing: Novel HP fluid-end assembly, long-life HP flow elements, eco-friendly fracturing fluid systems. 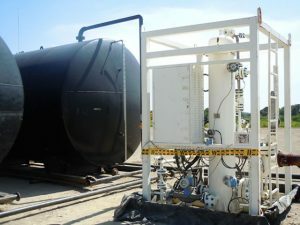 Oilfield Environmental Protection: flow-back fluid treatment and re-use, zero-discharge mud handling systems, produced water treatment and re-use, high efficiency oil-water separation. Advanced Energy and Environmental Protection: Low cost unconventional oil and gas field development, digital oilfield and production optimisation, brown field Enhanced Oil Recovery (EOR), oily sludge treatment and utilization. Haimo MPFM has been deployed to Agip fields, ExxonMobil fields, Total fields, Seplat fields, NPDC fields, Heritage Oil fields, Neconde fields, and Belema Oil fields in Nigeria with outstanding results.